Wow! The days are flying by this season and it finally feels like winter here on the Central Coast with freezing temperatures, frost warnings and the beautiful layer of ice covering grasses which begin to steam as the morning sun rises. This past weekend was celebratory for me. 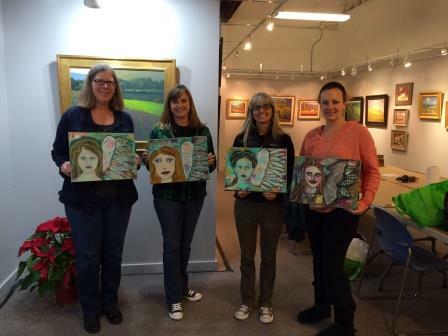 I taught my first mixed media class at Studios on the Park. We had a great small group of ladies which was just perfect for some one-on-one instruction. They were all new to painting and had limited experience with faces. They did an amazing job as you can see here. Speaking of learning to draw and paint faces, “Let’s Face It” is quickly approaching! Instructors have been creating their videos and we are all excited to begin sharing our lessons. If you haven’t yet enrolled, or are interested in learning more about the class , please visit my “Let’s Face It” HERE. Also!!!! I had my first Etsy sale this weekend! That was so exciting! “My Friend” was purchased. Those girls have been living in my office for just a short time and are so happy to have a new home! I was so motivated that I added a few new listings! If you are interested, you can check them out HERE . If you are looking for gifts, I have a few canvas bags available on my site, each with a different art print. I also have the option for customized “Thoughtful Hearts” available to order, or you can make your own through my video tutorial by signing up for my newsletter HERE. I hope that you are all having an amazing holiday season, whatever that means for you. More than anything I hope that you are surrounded by friends, family, pets, and that the new year offers new opportunities for learning and growth. Next postLet’s Face It is Almost Here!!! congrats on the sale and love the painting ! Thanks Miriana! It was very exciting.